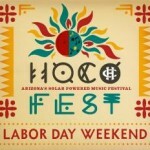 KXCI is proud to sponsor HoCo Fest. Hotel Congress hosts four days of HoCo Fest this Labor Day weekend with indoor and outdoor stages featuring The Tallest Man On Earth on Friday, Sergio Mendoza Y La Orkesta’s CD release party Saturday, and a 70’s Tucson flashback with the Dusty Chaps, The Dreadnutts featuring Bob Meighan, Chuck Wagon and the Wheels and Ned Sutton on Sunday night. HoCo Fest at Club Congress. The Tallest Man on Earth, Strand of Oaks, Wild Nothing, David Garza, Young Hunter, Lonna Kelley & more! In conjunction with Hoco Fest ’12, Hotel Congress is hosting the 6th Annual Record Fair & Music Gear Expo – perfect for novices, avid collectors and lovers of all things vinyl. Sergio Mendoza y la Orkesta CD release party, Camilo Lara of Mexican Institute of Sound, David Garza, Depedro, Dry River Yacht Club, Sweet Ghosts, The Cordials & more! Dusty Chaps, Dreadnutts featuring Bob Meighan, Chuck Wagon and the Wheels, Ned Sutton & more!